Thepla is a traditional Gujarati dish and i have posted a Methi thepla recipe long back. Recently when i learnt the Gujarati Methi thepla recipe from our Gujarati friend(who gave me the recipe of Bajra vadi). The interesting part in this recipe adding cooked rice to the dough. She said that it brings softness to the theplas. 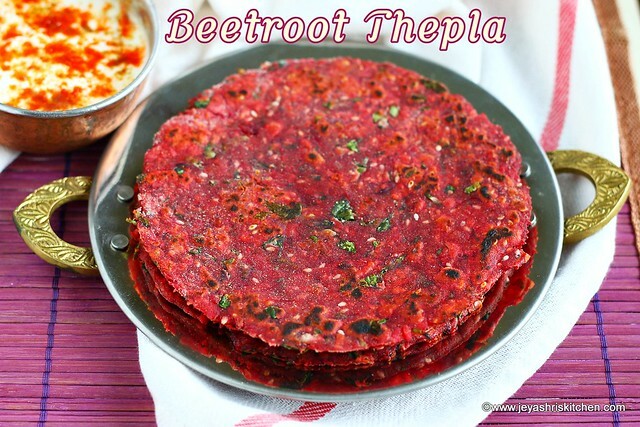 I wanted to make it as a beetroot thepla, so followed the same recipe by adding some grated beetroots to that. They turned so well and since we all love beetroot, we liked the theplas so much. 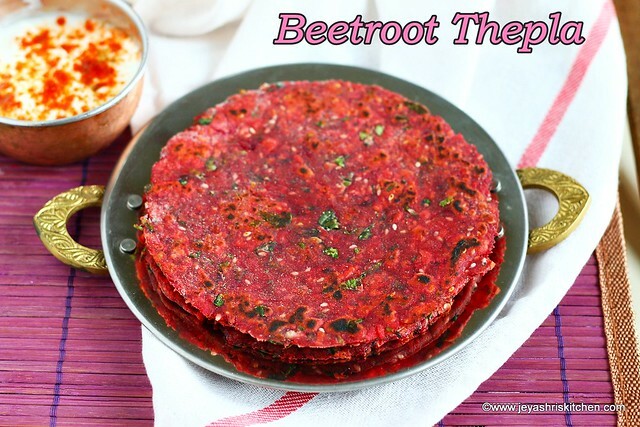 Try this beetroot theplas at home and let me know how they turned out. Grind the green chili and the garlic. In a wide bowl combine the whole wheat flour, grated beetroot, finely chopped methi leaves, sesame seeds. cumin powder, garlic chili paste, turmeric powder, salt and cooked rice. Sprinkle little water and knead this into a soft dough. Grated beetroot tends to leave water, so do not add more water. Once the dough is ready, add 1 tbsp of oil to this and knead it for 2 more minutes. Dough is ready. Divide this into equal lemon sized balls. Dust the rolling board with flour and gently roll the theplas. I used a lid of a box to cut the theplas into perfect roundels. Heat a pan and cook the beetroot theplas on both sides. Add 1 tsp of oil to this while cooking. Repeat this for the rest of the dough balls. These theplas tasted so yum and were super soft even after few hours. Adding cooked rice, gives softness to the theplas but the shelf life will not be more, we can not use this for travel or for next day. You can skip the cooked rice and add 1 more tblsp of oil if you are making the thepla for travel. You can skip the beetroot and add 1/2 cup methi leaves. You can add some finely chopped mint leaves to the beetroot thepla dough. Made it once and everybody in my college loved it and asked for it's recipe. Tysm for this wonderful receipe ma'am.